The old Cinebench 10 benchmark was limited to 16 threads. Luckily, the new Cinebench 11.5 does not have that limitation. Cinebench only represents a very small part of the 3D Animation market, but the advantage is that this a benchmark that you can perform at home too. 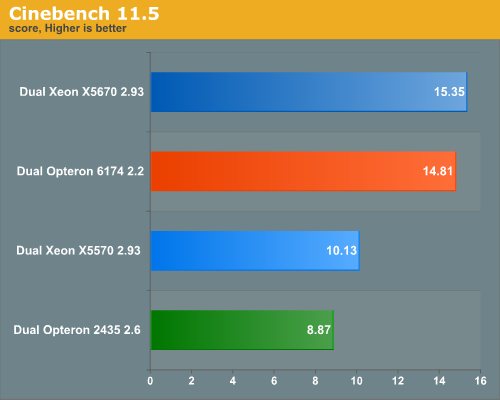 Although the Opteron 6174 manages to stay close to the newest Xeon, the Xeon is the CPU to get. The reason is that the performance difference will grow as you are rendering smaller and less complex scenes. In those cases, the percentage of the serial code will increase. And Amdahl’s law is unrelenting: in that case the CPU with the highest single threaded performance will win. You also get the benefit of higher single threaded performance when you are modeling.